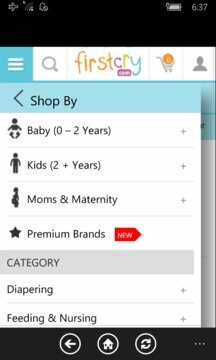 Get everything your baby needs with new and intuitive FirstCry.com Windows Phone App. Plus, FREE shipping on orders Rs499+. - We are Asia's Largest Online Portal for Baby and Kids Products. - We have over 90000+ items from 1200+ top National and International and Indian brands like Mattel, Ben10, Pigeon, Funskool, Hotwheels, Nuby, Farlin, Medela, Pampers, Disney, Barbie, Gerber, Fisher Price, Mee Mee and so on. - We have more than 1 Million + happy customers who rely on FirstCry assorted, handpicked collection for their baby needs. FirstCry.com is the fast, easy (and fun. ) way to get everything your baby needs delivered at lightning speed. 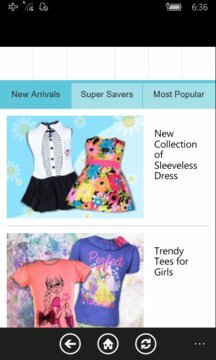 - SHOP ANYWHERE, ANYTIME: Shop tens-of-thousands of items using your mobile phone for anytime, anywhere access to your favourite high quality brands and products. - FASTER DELIVRY OPTIONS: For select products and pin codes FirstCry now offers “Next Day Delivery Service*". Under this service orders placed before 6 PM will be delivered the next business day and orders placed after 6 PM will be delivered the day after. * Please see product detail pages for estimated delivery times. - FIND STUFF FAST: Shop for diapers, wipes, formula, clothing and more in seconds. - VIEW BIG PICTURES: View large product images in all its glory. We ensure that the product is captured from every angle so you do not miss a thing. - SHORTLIST: Use Shortlist to save your favourite products as you browse the site and that too with a just a tap. - PRODUCT MEASUREMENTS: Yes we really do. . . We measure each and every cloth, shoe product in our warehouse to ensure no confusion is left in a parent mind while buying the product. - TRY AND BUY: Still not sure about the size . . . No worries . . . We offer you “Try N Buy*” option where you can try the products at home first and return them on the spot if there are size issues. Our representative will wait for you while you try out the products. - QUICK REORDER: Quick re-order will help you in reordering anything you’ve purchased in the past. - PRODUCT REVIEWS: Don’t just take our word for it. Find out what other customers think before you buy.